From what I have seen in my experience as a child born and raised in polygamy, there is always a favorite wife. Sometimes more than one. The children who are unlucky enough to be offspring of the mother who is not the favorite are often neglected and sometimes abused by their father. I have always felt great sadness and empathy for Abraham's son Ishmael, born to his slave woman. My dad once told my mom that it’s a natural thing for a father to take out the frustration he feels towards his wife on their children. That was a shocking admittance on his part! He was discussing someone else when he said it, but we realized that he was excusing himself for his own abuses. During their marriage, my mother had desperately wanted to give my dad a son, but she miscarried many times. One of those times she asked me to please run and get my father, who was at another wife’s house. I was about 10 years old, and afraid for my mom. I found my dad lying on my "aunt's" couch, watching football. I pleaded with him to please come. He rolled his eyes! Oh that’s right, it wasn't my mom's "night." He didn’t come over for several hours. He was never there for his suffering wife, but of course she should always be there for him. When I look through my genealogy records, I realize that in many cases the polygamous father dies alone. I wonder why. Because of our polygamous lifestyle, my sisters have no birth certificates and no education to know how to figure out how to get one (although they are trying to). I have one because my mom "rebelled" and sent away for it. This was brave of her, for she had learned to be afraid of everyone. I have seen that in many cases when a man deviates enough to have multiple women, he can also deviate to include his own children for his self gratification. A common come-back for this is that it happens in monogamous families as well, but it seems to me that people are supposed to strive for the very best human behavior, especially when claiming that God is on their side. I have known and heard of so many polygamous families who have lost the first wife and her children when another wife came into the family. Doesn’t that seem counter-productive? It happens over and over again. The new woman feels justified because the first wife agreed to the situation and then could not handle it. What makes people think that it’s the "strong" woman who will stick it out and share? The strong woman finds a better life for herself and her children! I wish for all women what I am lucky enough to have: a husband, and a father for my children, whom we don’t have to share with other women and children. My husband is a product of the same lifestyle, and he saw the plight of the women in his life. And he almost starved to death twice in his life because his mother had to leave him as a nursing baby in Mexico while she worked in the United States. The next time was in South America when they were stranded with no husband or father to care about them. As for me, I love my father but I believe he made the wrong choices. I sure wish his children would not propagate that lifestyle. 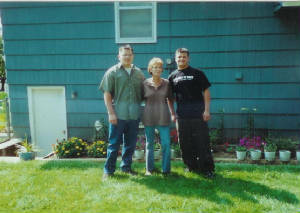 Jill with her sons. Marco is on left, Mario on right. I was raised by my father's Mexican wives in Mexico while my mother, who was American, worked in the United States to help support my father's four wives and huge family. All of her kids were shifted from one wife to another. I really didn't know my own brothers and sisters that well. It was like being an orphan. None of us could associate with the outside world until we had to go to school. This was by law or we wouldn't have been allowed to do that. That was when I really began to see how isolated we were. At first I thought that people saw and treated us differently because we were Americans but, little by little, I found out that it wasn't just that. I saw that the other children had only one mother and one father. It made me realize even more what I was missing. Still, I was very afraid to say anything or ask any questions of my parents until I was older. At the age of thirteen, right after I started my period, my mother and father tried to marry me off to men in our cult who were even older than my own father! They told us that, as girls, we could not marry out of our religion or out of our own race. I refused to marry. I gave them every reason I could think of, including that I was still playing with dolls. I don’t know how I got away with it - my older sisters were married off to older men when they were very young. We moved a lot and, when I was seventeen, we moved to Jinotega, Nicaragua, and there I actually got to live with my own mother for awhile. But I didn’t know her very well and was often afraid of her. I was at the dating age and really wanted to go to school and meet new friends, but my father moved us out of Jinotega into a jungle that was three days away from civilization called El Bocai. I was there for one week and that was when I really became rebellious. I told my mom that I was not going to stay there and somehow I was going to get back to Jinotega! Fortunately, my older brother, Kelly, was married and living there so I had a place to stay. After me pleading and arguing that I would never marry if I was only around family, my father finally agreed to take me back to Jinotega when he went. But all of the way back, he kept telling me that I was breaking God's commandments by not honoring him. At that point, I didn't care, I let it go in one ear and out the other. I lived with my brother for six months, and then my father, who was by then suffering from gallstones, gathered us all together and brought us into the United States. After a tortuous nineteen day trip with twenty-two people squeezed into an old UPS van, we landed in San Diego. There were times on that trip that we felt like we were suffocating! My father nearly died from his sickness. At the age of nineteen, I met a Mexican man named Humberto Barrios. He was a Catholic. I didn't care what my parents said, and I married him and had two children. From then on I had nothing to do with my mom's and dad's cult, but my past would not let me have peace. I suffered from anxiety, inferiority, and a pain inside me so deep that I turned to alcohol to try to stop it. When that didn’t work, I tried to take my own life. It has taken me over thirty years to face my past and deal with my agony. I was too unhappy and confused to make wise choices and I went through two marriages. On the third I got lucky. I found a wonderful husband who has stood by me through Hell. I couldn't even appreciate him before, but now I can see how much he put up with and am very grateful. At the age of fifty-one, I am beginning to see the light. I want people to know that polygamy is not the beautiful principle and lifestyle that some people try to claim it is. My mother, who at first believed polygmay was a part of God's plan for men and women, ended up leaving it too after suffering unbearable heartache. For years before her death, she told people that polygamy was a destroyer of natural affection. No matter what the polygamists say, it is usually terrible for the children. I know this from personal experience and that is why I am sharing my story with you.